My family had a variation of this dish while on vacation in London a few years ago. When we got back my dad was fixated on recreating the dish so he enlisted my help and we came up with this recipe. It wasn’t long before it became a family favorite. My boyfriend and I have started to make it as an entrée rather than an appetizer because we kept eating too many when they were served as a starter and we weren’t hungry for our dinner! 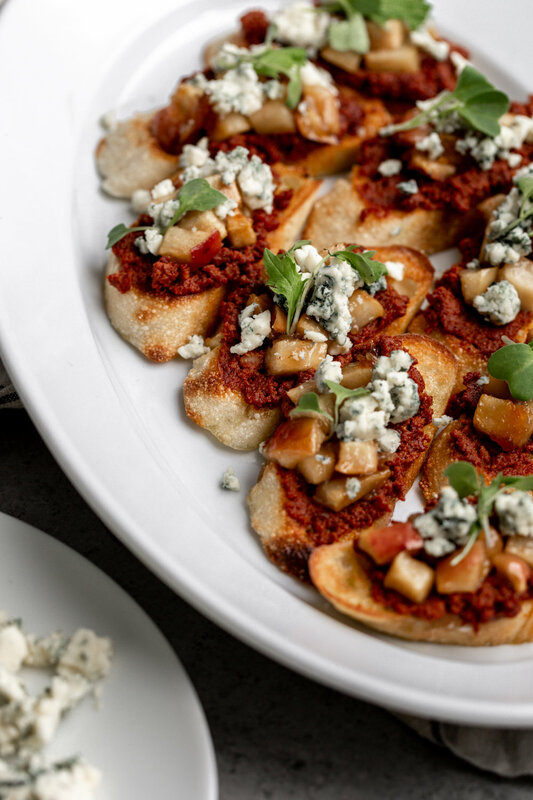 The sweet apples are a wonderful contrast to the spicy chorizo and creamy, salty flavor of the blue cheese. Preheat the oven to 350°. Combine the melted butter, brown sugar and flour in a small bowl. In a 9x9” baking pan toss the apples with the brown sugar mixture then bake in the oven until the apples are soft and slightly golden, about 20 minutes. Heat a medium sauté pan over medium heat. Remove any casing from the chorizo. Add the chorizo and cook, stirring occasionally, until the sausage is completely cooked through. Use a slotted spoon to transfer the sausage to a paper towel-lined plate and allow to drain. Preheat the broiler to medium-high. Dip one of the cut sides of each baguette slice in the olive oil, then arrange the slices, oil-side up on a baking sheet. Broil them just until golden brown, about 1 to 2 minutes. To Serve: Top each toast with a small spoonful of the chorizo and a small spoonful of the cooked apples. Sprinkle crumbled blue cheese over each and serve immediately. *Note: Mexican pork chorizo is a spicy seasoned beef sausage that is typically ground and can be cooked in the casings or removed from the casing and cooked like ground meat.